Oh boy you guys, this one was a doozy. First of all, for all you impatient folks, let's get to the pic of what I ended up with. Oh yeah, you love the vertical pic action. 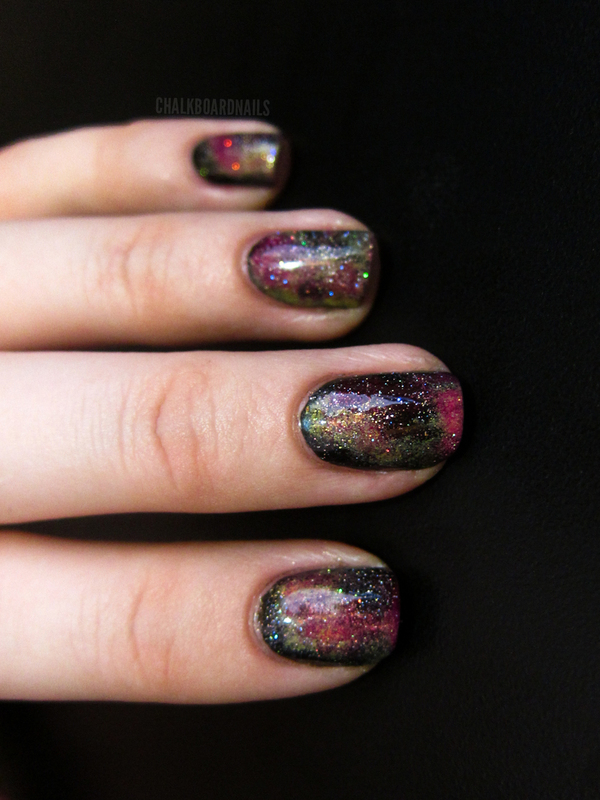 Okay, here's my long and sordid tale about trying to make a realistic looking space mani. The first attempt I made on this, I started out with a base of OPI Ink, which is a deep dark purple (lesson: use a black base if you want it to look realistic). Then I went CRAZY adding on colors. Rally Pretty Pink, Space Cadet, Sugar Plums... the list goes on. I ended up covering the black too much and it just looked like a regular old glitter mani. I pouted for a hot second and then took the whole thing off. The second attempt (the successful attempt) I started with a base of China Glaze Liquid Leather. Then I sponged on a very faint coating of China Glaze Happy Go Lucky, which turned out looking green after it had been applied. Remember, I use torn up bits of the triangle makeup sponges for my sponging. You don't wanna cover the whole nail with the spongings you are gonna do. Leave part of it black! Then on top of the Happy Go Lucky, I sponged on some Sinful Colors Dream On. It was starting to take shape! I added some China Glaze Skyscraper and a TINY BIT of Zoya Tanzy. BOO, I had wrecked it again. I had gone over the first two colors too much and you couldn't see them well enough. SO, I did another round of Happy Go Lucky and Dream On. Then I finished it off by adding in China Glaze Fairy Dust in the black spaces where I hadn't sponged anything. I found it looked better if you didn't put any Fairy Dust on top of the sponged areas. Let those shine through on their own. Then I topped with two coats of SV! And there you have it. Galaxy nails! Here's what my workspace looked like after everything was finished. 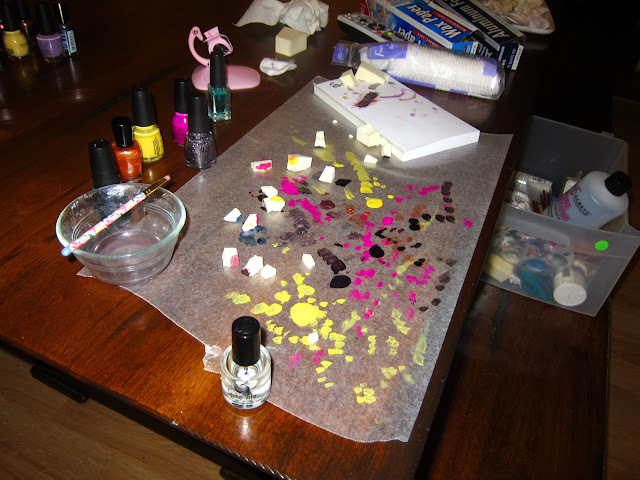 The stamps all over the wax paper are an attempt to get the extra polish off of the sponge before I sponged on the nail. Have you tried galaxy nails before? Was your experience smoother than mine? AWesome! I don't know that I would have the patience for this, lol. But it looks great! I always just dump my half bottle of Seche into another half bottle of seche-I don't try to tip the bottle-I alwayw knock it over!! But awesome job on the galaxy nails!!! Oh wow this really does look like a galaxy, you always do such an amazing job! It took me the entire length of "Trainspotting" to perfect my galaxy nails--I had to redo my right hand twice and my left hand three times. But to date it's the mani I've gotten the most compliments on! I used a toothpick to add little white star clusters, which I liked, though I added glitter as well and I think it was too much--next time I'll just do one or the other. @Sugar and Smile - Absolutely! I will add it to my list of posts to be made. I also have had requests to do a post on how I take my photos, so keep an eye out for that in the future too! Love it! Love it! Love it! I've seen galaxy nails all over Tumblr and drool every time I see one. One day I'll give it a shot. I think yours is the best I've seen. At least the hard work paid off!! I would have thought you did these nails in five minutes, they look flawless!! I wish I could do this!!! Of all the galaxy nails I've seen, yours are the prettiest. Good job!!! Hi I'm a new subscriber! This mani is a show stopper! It's absoultely amazing. Good job! Good luck for your 31 day challenge! 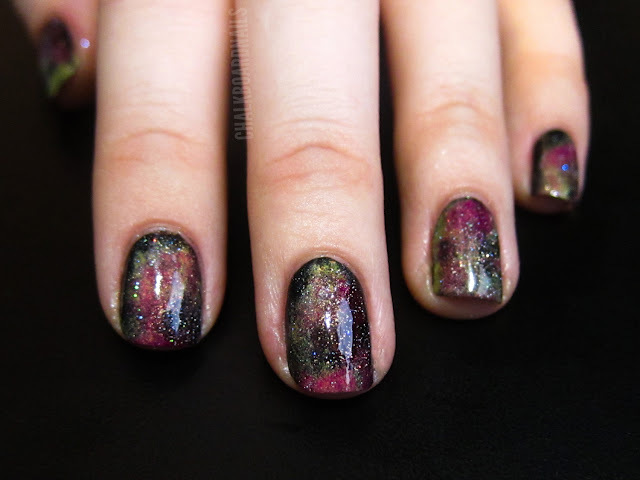 This is by far the best galaxy mani I've seen! Do you think Zoya's Ibiza would be a good base for a deep space look? I love the depth of Ibiza. I tried this using a dark navy blue as a base and then sponge on some pink purple green and a light pearl it looked amazing however the effect I got was more oil on water then space. However I was happy with the result and have gotten a lot of compliments :) maybe next time I will try it with a black base. I had a less than fun time. It spiraled from not having the exact colors (hey nai lpolish is expensive.) to having to use paper towels and Q-tips. But it worked out ok. If i had the right colors, and materials, I'm sure I would've been MUCH happier. I do just totally love this look. Looks great with anything! Best galaxy I've seen! I've tried doing a galaxy a couple times but it hasn't turned out quite right. Going to keep trying though! I am new to all this nail art and one of the first things I tried was the galaxy nail art. I ended up much like you. I still can't do the sponging technique properly. It finally did come out to where I liked it, thanks to a lot of glitter. Lol. I am now doing the 31 day challenge and dread tomorrow, the gradient effect! Oh no! I think your galaxy nails turned out gorgeous!